I was always intrigued by the imagery of Baba Yaga’s hut. I started playing with it a bit one day in my sketchbook. I kept adding layers of tracing paper to the sketch and refining the image. Finally, I took the top layer and put it on a light box. I inked it on a sheet of bristol board. The image still seemed lacking, so I brought it into Photoshop and added layers of creepy tree branches to act as a frame of sorts. Did I mention that you can pre-order this book? 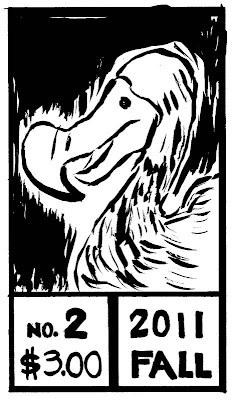 UPDATE: You can buy Dodo Comics #2 here. You’re smart enough to know that talking won’t save you.